2019 is shaping up to be an interesting year thus far for post-punk luminaries Gang of Four. With a new record in the can and a nearly sold-out North American tour behind them, the buzz and tension behind the band is palpable – no small feat for a band celebrating the 40th anniversary of a genre-defining record, one whose influence continues to have a ripple effect on modern musical culture. It hasn’t been all sunshine and rainbows, however. As previously reported, guitarist and longstanding member Andy Gill was hospitalized on the morning of the final show of their successful US tour, pulling the plug just moments before the band was set to take the stage at Brooklyn’s Music Hall of Williamsburg. 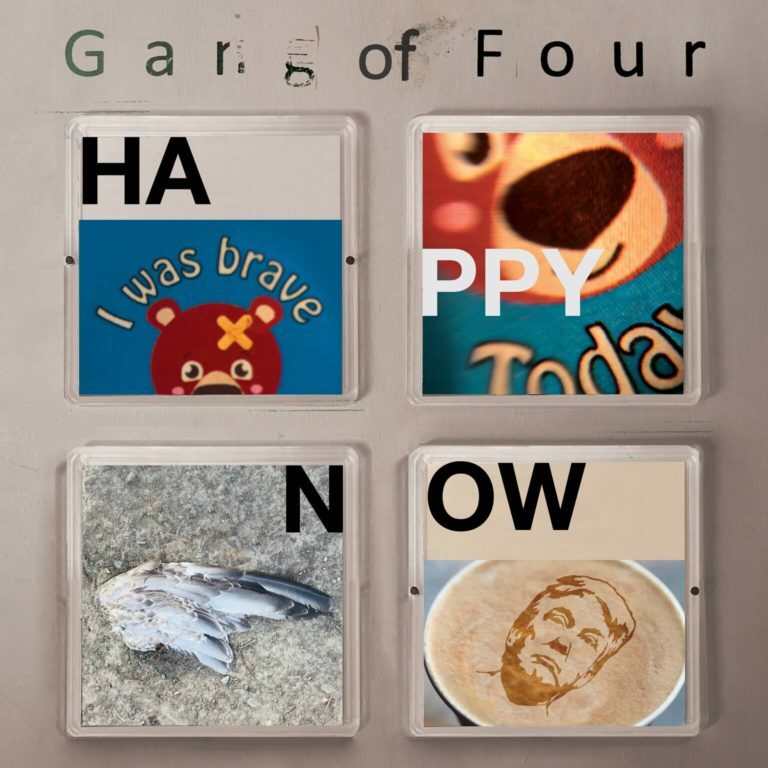 Gill has been recovering since, eager to resume plans for the year, which includes the imminent release of Gang of Four’s ninth studio album Happy Now which is due out on April 19th. The band was utilizing a pledge system to fund the record, with a series of perks still available via Townsend. Sorry we missed you in NYC a few weeks back. How are you feeling? Not perfect, but quite a lot better. It was a couple of different chest things that interacted with each other. I was really struggling to walk and breathe. I could breathe OR walk, but not both. I was arguing with the band, saying “we can do this, I’ll just stand still and I’ll be fine,” and the band was like “come on, you know you’re not well,” so we had to cancel. It’s not been quick, but i’m getting better. I admire the attempt – the moment was intense and I’m sure it wasn’t an easy decision. They had me in the hospital and I was like “I’m ok now, let’s go and do it!” but I was getting phone calls left and right. It was getting too late. With that in mind, I imagine it would be difficult to come back to NYC this year with VISAs in play – any future plans to return? There aren’t any VISA issues at the moment, funnily enough! We have to figure things out now though, because straight after America we were going to play Japan, China, and Australia. We gave it a week to see if there was going to be a super fast recovery, but it wasn’t, so we had to push those back. They’ve gone back to the autumn. We’ll definitely come back to America, but it’s just a matter of time at the moment. Aside from NYC, how did the rest of the tour treat you? It went very well. We started on the west coast, had a brilliant show at the Roxy in LA. We came cross-country from there and it was all going great. Whatever it was that happened at the end of the tour – we played Woodstock the night before Brooklyn and I admit, that was a bit of a struggle. Otherwise, it was all great – fantastic audiences, sell-out shows all over the place, so you know, it’s just really unfortunate. 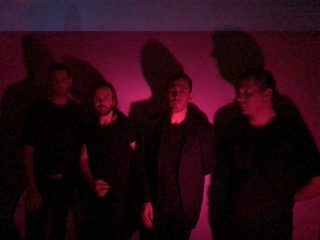 Happy Now is in the can and is due out in about a month – has PledgeMusic been a useful platform in gathering interest and promoting the release so far? It’s been a useful platform in practically sinking the release… It was a complete nightmare. I was starting to hear rumors late last year that things were very much not well in the Pledge world, and as we got into January we weren’t sure what was going to happen. They owe me a bunch of money from two years ago, even. We’ve taken everything off PledgeMusic, but they kept everything on their site until yesterday, but they’ve finally taken it down. We’ve moved everything to Townsend, which is a similar model. All the people that made pledges up to now – they have their own dedicated webpage where they can use the money that will be refunded by Pledge to get the same stuff they pledged for a very decent discount. Once they’ve had a shot, things will be public for everyone else to purchase what they like. Sorry to hear about that. Most experiences with this model have been positive for bands and gives fans a way to feel more connected. Deeply sorry to hear it didn’t work out. The band’s sound used a copious amount of electronics over the years. Are you using modern sounds or more vintage technology? There’s so much software and so many apps these days that I just shove it into the computer, mess around with it, see if I like it – I was getting into the sounds you get out of grime records and some of the more adventurous trap stuff, and I find that quite ear-catching. One of the things i did on Happy Now? was when I was talking to Thomas [McNeice] about the bass parts, trying to figure out what the four-string bass would play, and I was like “let’s leave a little hole here, and a little hole here and we’ll put in an electronic wobble sound.” That’s what we did on all the record. I don’t really have a philosophy about this – I just follow what I think sounds good to me. That’s the best way I can put it, really. I suppose the guidelines are “whatever I think is right” and I try not to worry about it. I sometimes expect to get more of a backlash against it – I expect people to say “it doesn’t sound like Entertainment! What’s wrong with just straight guitar, bass, and drums?” but fortunately I don’t get a lot of that. Most people seem to be quite pleased that Gang of Four doesn’t stand still and instead plows forward. Speaking of which, there’s such a plague of nostalgia culture, especially in regards to the way music is perceived and consumed. As you said, Gang of Four‘s music always felt more pure and forward-looking, which hopefully makes you exempt from this. With that in mind, I know Entertainment! turns 40 this year. Do you still feel connected to the record? I mean, it resonates with other people, and I think it has a couple of fantastic songs on it. I also think there are a couple of mediocre songs on it. Some people want to hear the record played in full, and there a couple of songs I don’t particularly fancy playing, and I might not bother with them. What sometimes happens, for example, in Japan they wanted us to play one night playing Entertainment! and a couple of songs, and the next night doing a regular set. There’s a balance I suppose. Looking back at that period, I think I would prefer Solid Gold, the second album, to Entertainment! in a way. I feel like Entertainment! was a work-in-progress of sorts. There’s some great songs on it, like “Not Great Men” for example, where we figured out how the drum beat should work with the guitar in that spare, but funky mishmash. I think that side of things got developed more on Solid Gold. So you feel there was a sense of urgency and inexperience and youthful energy on Entertainment!, but then with Solid Gold you were able to hone in on what worked and what didn’t, and that solidified things for you as a band? Yeah, I think “Not Great Men” was actually the last song written before recording Entertainment! and therefore was more of a sign post to where we were going. Entertainment! was definitely a snapshot in time, but I think your characterization is correct. I think the next record definitely developed things in the direction we truly wanted to go. Wound up getting banned, yeah! Classic piece of Gang of Four luck! That song had a lot of scathing humor, both a bit clever and obviously a little cheeky, and I don’t think that’s something people give the band credit for honestly. Are you still doing that kind of thing from time to time? Well, I mean “I Love a Man in Uniform” is kind of a schoolboy dirty joke. We’ve all got childish senses of humor. I mean, it’s a lot of fun having these double entendres, both militaristic and sexual meanings. The song went down very big with the gay community in the clubs at the time, and we were delighted by that. Gang of Four, in all its incarnations, has always liked a bit of humor. Sometimes it’s not always obvious, but with “Uniform” it was a bit more present than usual. Since you’ve been together for a bit now, did everyone from the live band participate on the new record? 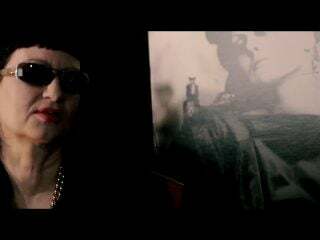 At that point, I was producing a German band, from Berlin, and I needed to record some backing vocals. Somebody recommended Gaoler [John Sterry], and that’s the first time I met him. He came down a few times and I wound up giving him a Gang of Four track to see what he could do, and I thought to myself “this sounds really good.” So, we worked on that and then he joined up with the band. So when I got round to this record, there was no question about it, this was his record to sing. Apart from one track, he sings it all. So, as you say, it’s us four. 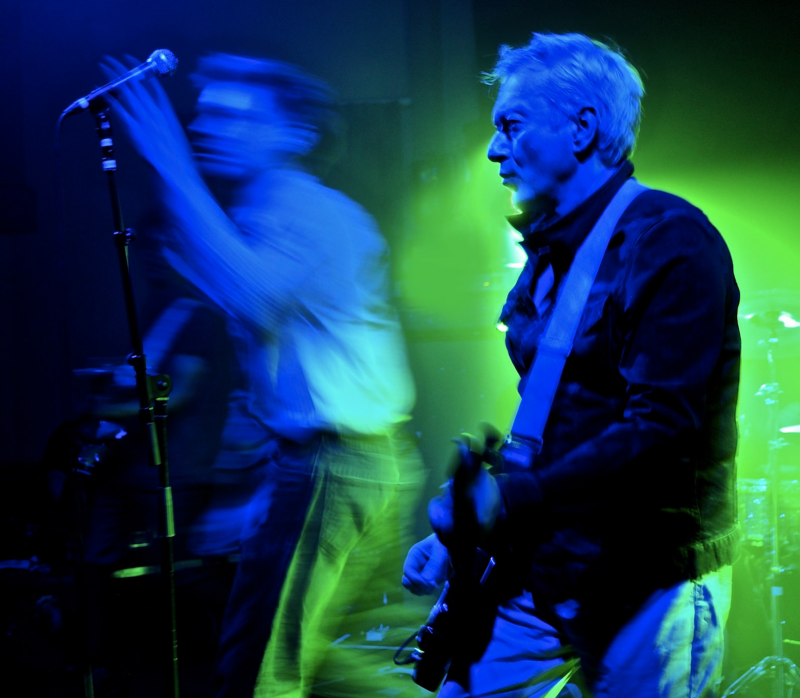 How do you feel about Gang of Four’s lasting legacy – all the bands who exist because of your music? It’s flattering that all these great artists – whether it be R.E.M. or Rage Against the Machine, all these bands that I admire, it’s great that they’re talking about our influence after all this time. I even hear it in places you wouldn’t expect, like on the Frank Ocean track that samples “Anthrax” – it’s even more impressive when the music permeates pop culture like that. Frank used that sample, and bless him, he even had it properly cleared! In itself, I admire that. It may be subtle compared to some of the other bands from the era, but I reckon politics have been a huge component to Gang of Four‘s fury. Have modern political events, including Brexit, Trump’s Election, and the rise of white nationalism and anti-muslim sentiment influenced Gang of Four‘s current lyrics? In the various incarnations of Gang of Four, I’m actually not terribly keen on commenting on current affairs. Clearly, on this record, there’s the Ivanka song [“Ivanka (Things You Can’t Have)”] and there’s at least one or two references to Trump in the song “Alpha Male.” I suppose you could say I made a bit of an exception there, but to me, the thing about Ivanka doing her thing – it was a very special moment in time. Trump gets into the White House by whatever means, and a lot of people are finding his demeanor and way of explaining himself very unsympathetic, so they wheel out the attractive daughter to try and put a nicer human face on the Trump philosophy. We had a couple of speeches, including the one with “I don’t know what it means to be complicit,” and there’s something so poetic about that, the fact that it’s her that comes out to say this stuff. What it is, is what it is, which is to say it’s a very conservative, right-wing ideology. I think that’s kind of indisputable and it just happens that she comes out to be the spokesperson for it in a very peculiar and interesting and breathtaking way. I think that’s why I kind of broke the rule of not going with current affairs. The thing about Gang of Four is that we’ve never prosthelytized, never told people what they should be thinking – it tends to be observational and descriptive and I think that’s why it has some potency, I think. You’re right – there are a lot of records that point at a certain presidency or a single political event, and it just freezes the message in amber, if you will. Not to say it isn’t vital music or an important message, but twenty years from then, it’s harder to connect to. If you’re going to go that route, all the better to be subtle about it, if possible. …Can’t wait! I mean, think about Bob Dylan. I like much of his music, but some of his more heated tracks are important for those who were there, but it’s hard to feel that fire in 2019. Even the records about the Bush presidency, it wasn’t too long ago and it felt important at the time, but I can’t really remember much about the music. Well, you’re making me think now. “Alpha Male,” which has a super heavy, über groove, I mean it’s got a little sample of Trump saying something like “so sad, so pathetic.” I think it might stand the test of time because of the way it sounds…but if the whole song was about him, I’m sure it would date itself in time. Well, I’m sure we’ll all be feeling the effects of this presidency for some time, whether we like it or not. I think the thing that’s different now is that when we look back on say, Bush – people had their opinions about him, but it wasn’t the numero uno issue. Right now, last year, this year, whatever, we’ve got Trump, we’ve got Brexit, we’ve got the far right in Europe, it’s this great big shadow over the world. It’s not easily dismissible, and it’s going to be around for a while. At least music is a way to cope with it, I hope it’s the same for you. Making art, even if not addressing the situation, is a way to cope.